10/09 - Portland Marathon - 7:30 am! Galen Fous is a Portland based, innovative, acoustic guitar finger-stylist and singer/songwriter. His music is compellingly original and combines elements of jazz, classical, latin, brazilian, celtic, contemporary folk, rock and more into a modern fusion of traditional genres. The songs are rich in mythos and emotion lyrically and musically…held by unique chording, diverse rhythms, and an amazing finger-style technique developed over the last 40 years. “Galen, I love your music. You bring in a huge array of musical influences (jazz, blues,latin, celtic, and other fusions) and do an amazing job balancing them all out.” Noah Bernstein, Camelia Lounge in the Pearl. 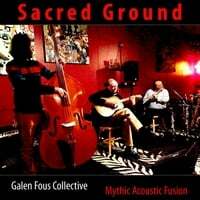 Sacred Ground - to sample, click song title, click "Buy" to purchase!